Swedish steel wooden handled hoof knife, stainless steel blade, double edged so left and right handed people can use it. Robust hoof claw cutter. 30 cm length. Farrier type pliers. 115mm abrasive hoof paring disc for trimming cattle feet. For use on a 4.5" angle grinder. Swedisg steel wooden handled left handed hoof knife. Single sided blade. Left handed hoof knife with aesculap ebony handle, narrow blade. 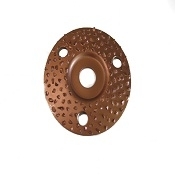 115mm abrasive discs for hoof paring. Sold as a pack of five. For use on 4.5" angle grinders.